The land must not be sold permanently, because the land is mine and you reside in my land as foreigners and strangers. Chicago has a fascinating tradition that's in some ways a much a part of its fabric as the Cubs and Sox, deep-dish pizza, windy winter days, and skyscrapers. It's a tradition for snowy days during the winter months, when the combination of heavy snow, narrow residential streets, and lots of apartment buildings make parking a challenge. It's the tradition of putting household items out on the curb to reserve parking places. So someone, sometime, came up with the idea of bringing out an old lawn chair to put in his spot until he got home. It's actually fascinating to notice as you drive through Chicago neighborhoods just what people will use to reserve their spots. I've seen floor lamps, couches, bar stools, bookcases, and old tires. Some folks go the utilitarian route and use orange traffic cones. Quite a few use sawhorses with No Parking signs hanging from them. I've seen chairs, coffee tables, and I read about a guy who scatters a couple of boxes of screws and roofing nails in his spot. (It takes him an hour or two to pick them all up — in which time, of course, he could drive around and find another place to park...) I've even seen an old toilet. Once, I drove by and saw a kid standing in a freshly dug-out space. I could only assume his parents didn't have a spare lawn chair or an old toilet. There's even a Wikipedia page about the practice. Despite the fact that it isn't legally possible to own a parking space on the street, no matter how much time you may have spent digging it out, to move someone's space marker and park in their space is to ask for retaliation in the form of a broken windshield, slashed tires, or angry confrontations. And that's just the elderly grandmother who lives down the street from me. People get possessive about those parking spaces they work hard to dig out. Psychotically so. Remember when you were a kid and would call “dibs” on something? It's like that, only more so. So I sometimes wonder what would happen if someone dug out a space in front of their neighbor's house, and then reserved it for him. That would just be weird, wouldn't it? It would fly in the face of everything we assume in our world to be right. If you doubt that, try it sometime. I'm guessing that your neighbor won't know what to say or how to respond. It's just too strange, just too opposed to the popular notion that says “What's mine is mine.” There are only so many places to park, after all. If you take my space, where will I put my car? You can be excused if you haven't heard much about the Jubilee year in the Old Testament. The Law of Moses decreed that every fiftieth year was to be a year of general amnesty and redemption. Specifically, any sale of property made in the previous fifty years was nullified and the property returned to the family that originally owned it. The purchase price for property, in fact, was supposed to reflect the number of years left until Jubilee. Sounds pretty strange to us, doesn't it? Keep in mind, property in Israel was assigned by tribe and family, so for there to be equity those tribal possessions needed to remain fairly constant. That was the practical reason for it, but the practical reason rested on the theological one: the land on which Israel lived didn't belong to Israel at all. It was God's land, given to them because of his generosity and grace. Every fifty years, they had no choice but to remember it. I can't begin to imagine the economic implications of something similar to a Jubilee today. 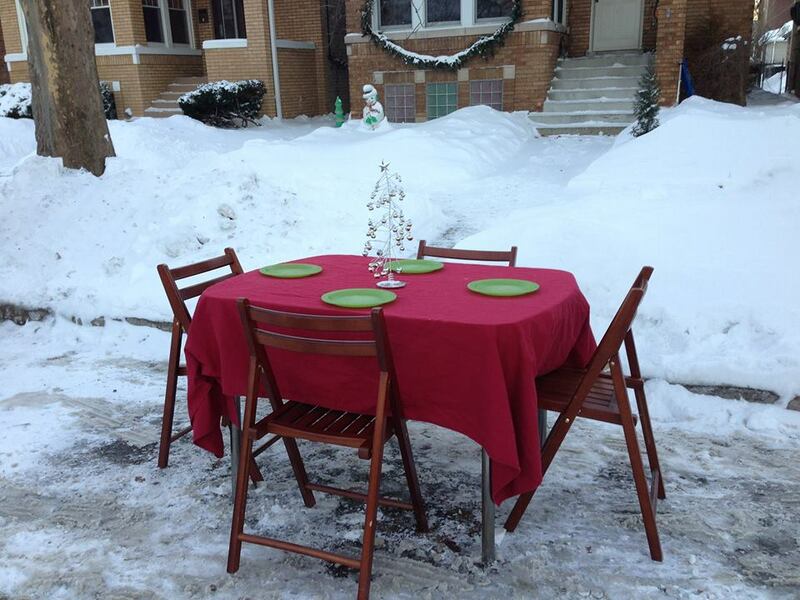 And, hear me now, I'm not advising you to help yourself to your neighbor's parking space this winter. Not everyone's ready to celebrate a Jubilee, you understand. I do think, though, that as God's people it would do us good to remember that what we own isn't as much ours as we tend to think, and to try to mold our attitudes about “our” stuff accordingly. As the Jubilee laws of ownership remind us, though, our attitudes won't be molded if our actions don't change. Where our treasure is, there our heart will be also, Jesus said. If our habits in regard to collecting and keeping stuff look no different than the habits of those who don't recognize that God is ultimately the owner and bestower of everything we have, then we shouldn't be surprised when our attitudes begin to reflect theirs, too. In short, if you act like you have “dibs” and take special care to mark off yours from theirs, it won't be long until you start to believe it, and God is out of the picture entirely. Maybe what we need, in this land of affluence and opportunity, the birthplace of the American Dream, is a good dose of Jubilee. We who set such stock in titles and deeds and all the myriad ways we call “dibs” on stuff that we don't want to share might now and then need a reminder that God isn't necessarily impressed with the legal chairs and traffic cones and sawhorses we use to keep other people away from our stuff. In fact, in God's world it might just be that he makes us trustees of his resources so that we can be a blessing to those other people. So declare your own personal Jubilee. You're not allowed to declare your own debts cleared, you understand, but maybe God's calling you to free someone from a debt that they owe you and are having trouble paying back. Maybe you have something that someone else could use, and he's calling you to give it to that person. Maybe he's asking you to welcome someone as a guest in your home — the home he gave you. Maybe he's calling you to use your expertise to help someone without worrying about whether you get compensated or not. Whatever blurs the lines of ownership, reminds us that it's really God through whom all blessings come, and removes the markers that tell others that some of the things you have are off-limits — that's Jubilee. All that old furniture in front of your house looks kind of tacky, anyway.